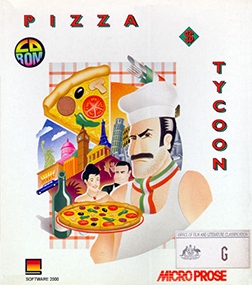 Pizza Tycoon is a business simulation video game designed by the German company Software 2000 in 1994. It was published under the title Pizza Connection in Germany and as Pizza Tycoon by MicroProse abroad. The game is centered around being the manager of a pizza restaurant in a town in Europe or the U.S.A. It gives the player the option to choose among more than thirty different characters, to create one's own pizza, have cooking contests and modify the display of the restaurant and kitchen. One particular original theme is that the player has the availability to call upon local mafia to sabotage competitor restaurants or get money from criminal activities such as weapon and drug dealing. In these YouTube videos, user InfluxNUFC play Pizza Tycoon, showing different parts of the game. If you want to play Pizza Tycoon, you can no longer download the game here. You may need to use some sort of DOS emulator, like DOSbox, in order to make the game run. See also: Running Pizza Tycoon in DOSBox. A short tutorial on how to run the old DOS-game Pizza Tycoon in DOSBox. This Pizza book will take us on a magical trip to Italy. The Italians say that eating is the second most beautiful and important thing in the world. The cave men baked bread which looked like a pizza, a round flat dough-cake made from flour and water, baked on red-hot stones. The classic pizza as we know it today is about 300 years old. The ancient Egyptians taught the Greeks the art of baking bread. Soon the Greeks surpassed their teachers and began to enrich the dough with spices, oils, eggs and herbs. They were also the first to cover the dough with toppings before baking, thus turning the pizza into a main course. The Italians were equally inventive where good eating and making the most of very little were concerned. The cuisine of the region around Naples offers delicacies that are appealing to the taste buds as well as to the eye. The harbour town of Naples is the culinary centre of Southern Italian cuisine. The classic pizza owes its existence not least to the discovery of the tomato which was brought to Europe from Mexico. The cook who first refined the slightly dull dough cake with pureed tomatoes, oil, salt and a little cheese was, of course, a Neapolitan. Many of his fellow citizens loved the new recipe and copied it. Thus the best-known pizza, the pizza Napoletana, was born. Today the pizza has fans all over the world.